After Jackie Eagan graduated from Arlington High in 2005, she knew she wanted to be a doctor. But before the 22-year-old lifelong resident of Arlington heads to medical school, she’s spending a gap year in the capital of Denmark. Eagan is unique, though, according to Dr. Lorrie Comeford, a chemistry professor at Salem State College, who said science majors rarely take classes in foreign countries. Eagan, a 2009 University of Connecticut graduate who majored in physiology and neurobiology, has applied to a handful of medical schools in Massachusetts, including Tufts School of Medicine and the University of Massachusetts Medical School. She recently flew back to the United States in February to interview at UMass and spent a few days with her family. Her ultimate plan is to get accepted into one of the medical schools she has applied to and begin her schooling in the fall. Initially Eagan, who has lived in her house on Gray Street since she was born (her parents still live there), decided that she wanted to study abroad a few years ago after getting close to a friend from Sweden. But she has had a passion for the sciences for much longer. “Science has been my only focus since high school. It started in an intro biology class with a teacher who became my friend and mentor, Mr. Don Bockler,” said Eagan. Eagan said Bockler, who recently passed away, was one of the best teachers she had at Arlington High School and he was the one who first inspired her interest in human physiology and biology. A job in the stem cell lab at UConn only deepened her passion. 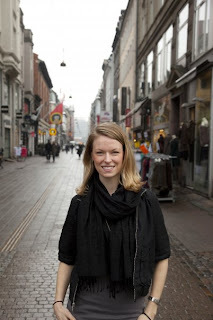 After graduating from college, Eagan decided that she wanted to go back to Copenhagen so she applied for an internship at the Danish Institute for Study Abroad (DIS), where she had taken classes during her study abroad experience. "The DIS had an amazing medical program and going to class was just like going to a medical school class in the States. It was much more hands on than any other class I had ever taken," Eagan said. Her job entails planning study tours, setting up classes, creating syllabuses, advising students and working with doctors on a medical program—all as a part of her internship. For many, though, taking a gap year is not an option, and Eagan realizes that she is lucky to have the opportunity. “I think it really gives me something to talk about to med schools, along with work experience, a chance to make a network with foreign doctors, and also an interesting twist to my application and life in general,” she said. Although Eagan said that she has been adjusting well to the culture change and learning Danish, she still admits that it hasn’t been easy all the time. One of the biggest things that she misses during her time abroad is having her network of people and friends. But Eagan believes her time in Copenhagen has been beneficial and her experiences are not lost on those around her. I am student of medical, but nicely help this article in all of science and medical students, for more help in this write my essay | Essay Yard. Thanks for sharing this informative blog. Currently I have completed Digital Marketing courses at a leading digital marketing company. It's really useful for me to make a bright career. If anyone wants to get Digital Marketing Training in Chennai visit infiniX located at Chennai. Rated as a No.1 digital marketing company in Chennai. Thanks for sharing the informative blog. If anyone want to learn SAP Training in Chennai in real time please visit IICT Chrompet which is best training institute in chennai for SAP manged by real time experts.. This Oracle 11g Release 2 RAC & Grid Infrastructure Administration and Linux is most popular OS in UNIX World. Linux is Open platform OS. All IT Giants IBM, Oracle, Novell, Red hat are jumped in to Linux world as Linux will undertake the IT. The SAS system is a powerful software program designed to give researchers a wide variety of both data management and data analysis capabilities. Thanks for your informative article. With the world is totally dependent on internet, the future of digital marketing is on positive note. It also assures lucrative career opportunity for professionals looking for job in digital marketing. Thanks for sharing this informative blog. Recently I did Digital Marketing courses at a leading Digital Marketing Training Institutes in Chennai. It's really useful for me to make a bright career. If anyone wants to get Digital Marketing Course in Chennai visit infiniX. It's really nice story, thanks a lot. Looking for an IT Career..? Get Trained to Get Placed in Top MNC companies. SLA Institute No.1 Software IT Training institute in Chennai offers you Best Software Training on Tailor made Corporate approved syllabus with 100% Placement that promises you the Job. Looking for an Final Year Projects...? Thanks for sharing this informative blog. Recently I did Digital Marketing courses at a leading Digital Marketing Training Institutes in Chennai. It's really useful for me to make a bright career. Great ?I should certainly pronounce, impressed with your website. I had no trouble navigating through all tabs and related info ended up being truly simple to do to access. I recently found what I hoped for before you know it in the least. Quite unusual. Nice article..
Great Story , learning is the only matters , which will help you until you dead .That is why safety Professionals focus on the occupational health and safety of the employees ever . Attending the health and safety Courses really valuable . Learn the medical issues will help you ever. Its nice post!The DIS had an amazing medical program and going to class was just like going to medical school class in the states its was much more hands on than any other class i had ever taken the opportunity. Informatica Training in Chennai located at Chennai Adyar which offer Best Informatica Training in Chennai. Thanks for sharing this niche useful informative post to our knowledge, I have read your blog and i got a very useful and knowledgeable information from your blog.its really a very nice article.You have done a great job . If anyone want to get Oracle data guard training in Chennai, Please visit Greens Technologies Oracle data guard Training in Chennai located at Chennai Adyar which offer Best Oracle data guard Training in Chennai. I have read your blog and i got a very useful and knowledgeable information from your blog.its really a very nice article.You have done a great job . If anyone want to get Best Selenium training institutes in Chennai, Please visit Greens Technologies located at Chennai Adyar which offer Best Selenium Training in Chennai. I have read your blog and i got a very useful and knowledgeable information from your blog.its really a very nice article.You have done a great job . If anyone want to get Best Oracle training institutes in Chennai, Please visit Greens Technologies located at Chennai Adyar which offer Best Oracle Training in Chennai. in Chennai, Please visit Greens Technologies located at Chennai Adyar which offer Best Oracle Training in Chennai. in Chennai have spread around the web, but this is a unique one according to me. The strategy you have updated here will make me to get trained in future technologies Hadoop Training in Chennai By the way you are running a great blog. Thanks for sharing this blogs..
Digital marketing course in chennai. Mobile application testing is the application software that is developed to handle hand held mobile devices. The testing in mobile application can be done by automated or manual type. After reading your post,thanks for taking the time to discuss this, I feel happy about and I love learning more about this topic.keep sharing your information regularly for my future reference. This content creates a new hope and inspiration with in me. Thanks for sharing article like this. The way you have stated everything above is quite awesome. Keep blogging like this. Thanks. Thanks for sharing article like this. The way you have stated everything above is quite awesome. Keep blogging like this. Thanks. Thanks for sharing . risk are important part of your life . we provide 100% real-time, practical and placement focused Linux training in Chennai. Our Linux course concentrates from basic level training to advanced level training. Nice content. Software testing is the process of finding software bugs by executing program. Very nice and informative post.. The structs is a complex data type declaration used in the C programming language that helps you to define a physically grouped list of variables to be placed under one name in a block of memory. Still i am medical student this is useful for me thanks for sharing this is very useful and creative blog!! Nice article. Glad to found your blog. Thanks for sharing.
. I’m happy that I came across with your site this article is on point,thanks again and have a great day. Keep update more information.. Very likely I’m likely to bookmark your site . You surely come with remarkable articles. Cheers for sharing your website page. Thank you for taking time to provide us some of the useful and exclusive information with us.I bookmarked this page.keep up the good work. Nice. happy to visit your blog. Thanks ! Your blogs always have great information to offer, i have to admit that whenever i see a page on Gordon college news i can't pass on without reading. Errors correction help offered by the most qualified experts. Thanks for your article on digital marketing. The main objective of digital marketing is to promote brands from low quality to high quality. Start to learn Digital Marketing course in Chennai.it is really useful to achieve a bright career. very good.the best informatica training in chennai» the best informatica training in chennai. nice. the best uml training in chennai» the best uml training in chennai. the best oracle-apps- dba training in chennai» the best oracle-apps-dba training in chennai. QTP is a software Testing Tool which helps in Functional and Regression testing of an application. If you are interested in QTP training, our real time working. Thanks for posting such informative blogs and articles. Here 100% job oriented training & placements in chennai. Jackie Eagan reminds me of my life in junior high, i really needed a change of environment to have some fun because i knew that once i begin my university it will be serious business. Papers proofreading services I like the fact that you found working in Denmark to be an adventure. Its a great country. You have posted useful article to every one. Thank you for the information success always. Jackie Eagan is an inspiring person. This article has taught us many things that have definitely helped to make life a lot easier. I will without doubt keep on visiting this site for more interesting information. Looking for Professional SOP writers to assist you? Look no further since we are there to help you.